There is a certain self imposed pressure being the brother of the guy who started the Year of Giving. I somehow feel that I should be very good at giving $10 away. The problem is, I'm terribly shy. Many people who know me don't believe it, because once I know you, or if I meet you when I'm with others who know you, I don't appear to be shy at all. But ask me to initiate a conversation with a complete stranger all by myself--well let's just say it is very difficult for me. While I didn't do nearly as good of a job as Reed, this year's experience went better than last year's. Last year I got refused several times, before finally giving my $10 away. This year I was only refused (sort of) once. I approached a man just sitting on a bench peacefully. As soon as I started asking him if he could participate in the year of giving, and that I'd like to give him $10, he pulls out his phone and says it is work, and he has to take the call. I'll give him the benefit of the doubt. 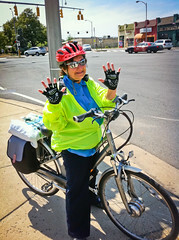 I was at the intersection of Washington Blvd and Clarendon Blvd in Arlington, waiting to cross the street, when Maria rode up on her bike. She smiled at me, and I so I said hello and went into my spiel about the Worldwide Day of Giving. Despite a morning prep talk from Reed, I still got very little information about her, despite the fact that she was very willing to participate. All I know is Maria is from Mexico, and she was very honored to be chosen. I spent more time telling her about the project than I did asking her questions about herself. How self centered is that? I did remember to ask her what she would do with the money, and she said that this seemed like a very special $10, and that she should find someone special to give it to. Oh, and I did get a picture of her. Her first response when I asked her was "I will break your camera." I told her that my brother wouldn't believe me that I gave my money away unless I had proof, so she obliged. She was eager to help me prove it to Reed and so she is shown displaying 10 digits in the photo (her idea, not mine). All in all a good experience, and I look forward to 2012 being even better!